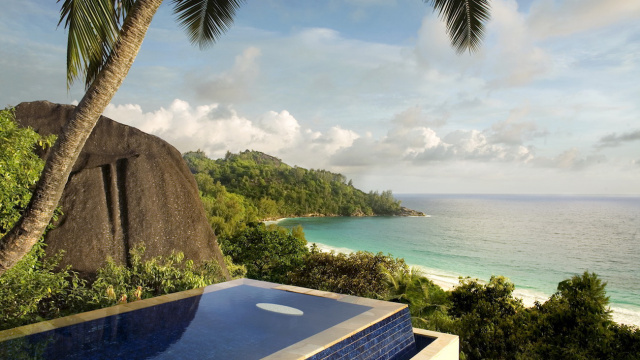 Seychelles, the archipelago of marvelous beauty takes vacation to the next level. It combines idyllic beaches and sights with luxury and well-being. 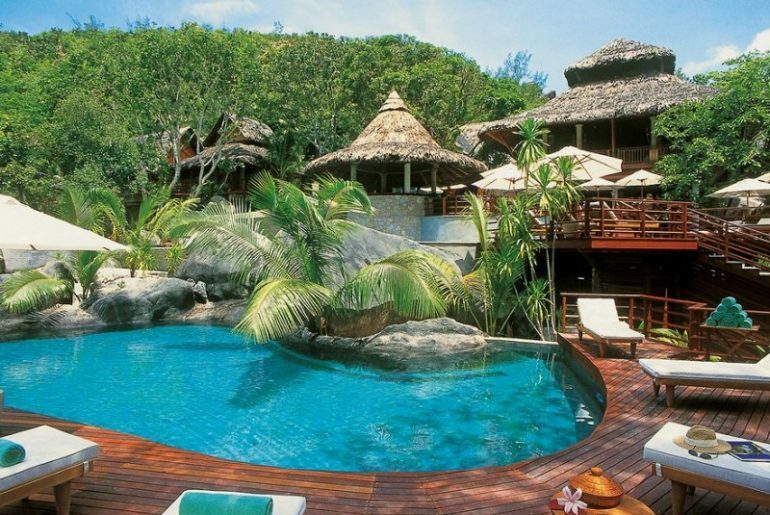 Let us have a look at some of Seychelles’ 5 Star hotels. Tucked away in glorious seclusion on the north-west corner of Praslin, the Constance Lémuria is the perfect mix of nature, style, service and facilities. This luxurious hotel is an ideal escape from the stress of daily life. On its doorstep you will find three fantastic beaches, washed by the warm iridescent waters of the Indian Ocean. Featuring a real picture-postcard perfection, the Constance Lémuria is surrounded by luxuriant and rare vegetation, which acts as a shield from the prevailing winds. For you to enjoy the highest standard of luxury and comfort, the hotel has recently undergone an extensive renovation, freshening up all the main areas and suites with a colorful new look and feel. Constance Lémuria exudes the quintessence of elegance and refinement with a touch of exoticism and envelopes unique experiences that transforms into a lifetime souvenirs. With its unique combination of pink granite, marble, thatched palms roots and natural wood, Constance Lémuria transforms your stay into a dream. Following the same elegant theme, the suites and villas of Constance Lémuria contains all the mod-cons you would expect from a world-class hotel. The Constance Lémuria invites you to experience the epitome of luxury with its stylish spacious suites and villas with swimming pools that seems to be crafted by nature. Holiday seekers that love to combine their vacation with some golfing, will be at heaven in Constance Lémuria. The hotels offers an 18-hole championship golf course of 80 hectares with Par 70. It also offers numerous water and land activities. The Four Seasons Resort is a real glimpse of paradise, a stay here is akin to residing in the ‘garden of Eden’. 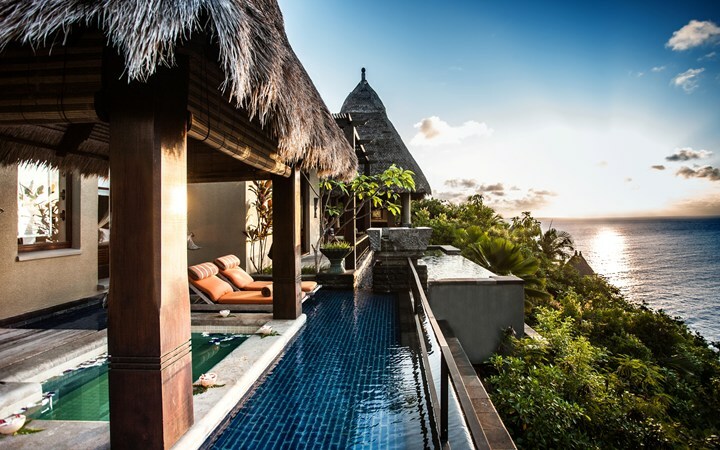 Carved into a hillside on the island of Mahé, the Four Seasons Resorts comprises of 67 tree-house villas and suites perched in lush vegetation above the bay of Petite Anse. The place itself will make you feel welcome from the moment you arrive, with its mesmerizing sights, amazing beach and the pure atmosphere only enhance this feeling. Ideally located, the Four Season Resort offers unparalleled natural privacy mixed with unique experiences that stirs the senses. The hotel is about 30 minutes from Mahé International Airport. Built in a traditional Creole design featuring natural timber and brick, the suites and villas are all very spacious and have every facility and comfort that you might expect. Either situated in the gardens or perched on the rocks, the suites and villas of the Four Seasons Resort emphasizes on the intimacy and contentment of its guest. If you are heading there with your families, we recommend you to stay in one of the Garden-View Villa. In term of activities, you will not be disappointed. The hotel overflows with indoor and outdoor activities to keep you busy. Better described as a sedate sanctuary, the Maia Luxury Resort and Spa is simply the most private and discreet resorts you will ever find. Enjoying an idyllic hillside setting along the pristine white sand beach of Anse Louis on the south east coast of Mahé Island, the resorts offers something more than just breathtaking views, it gives you a place to restore yourself. The resort contains wonderful and well-established villas set amidst 30 tropical acres of flowers and palm trees. 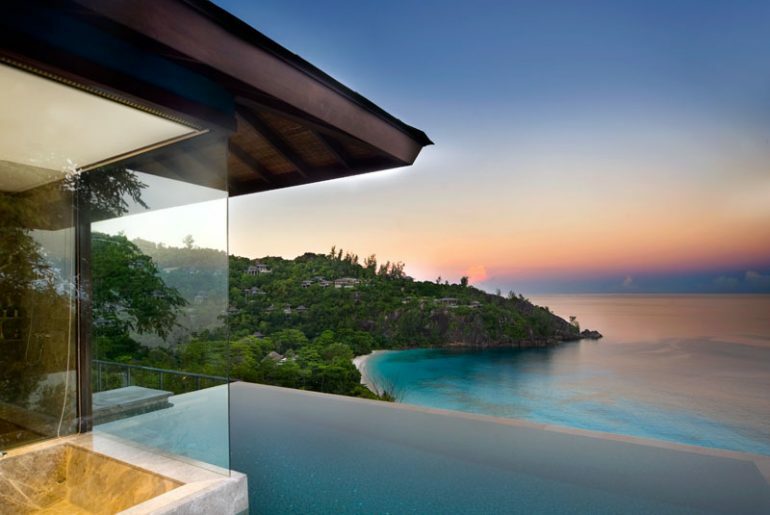 Adorned in natural stone, sleek furnishings and glossy woods, the resort is also one of the most beautifully design establishment in Seychelles. The hotel is a 25-minutes’ drive from the international airport and a 30 minutes’ drive from the capital city of Victoria. Design in a contemporary style with African and Asian influences, the Maia Luxury Resort and Spa makes it a priority to contribute positively in its guest experience. It offers spacious villas, in a calm and peaceful atmosphere. Each villas has a private butler service. Guest have the freedom to dine wherever, whenever and on whatever they desire at Maia Luxury Resort. The restaurant offers Mediterranean, Indian, Asian and Creole cuisine. The restaurant boast an impressive wine collection where private tastings in the hotel’s wine cellar can be arranged. Cradled in the heart of the island of Praslin, the Raffles is a multi-award winning resort. Located on the white sandy beach of Anse Takamaka and just few minutes from the tremendous Anse Lazio, the resort beckons travelers to return again and again. The hotel is an oasis of calm and tranquility, offering breathtaking views of the Indian Ocean and ensures an intimate and charming atmosphere. Beautifully designed by Ross Macbeth, the resorts features a contemporary architecture, which blends sublimely with its surrounding. To access the hotel from Mahé Island, you can take either a 15-minute shuttle plane, followed by a 30-minute drive to the resort or a 45-minute sea ferry ride, followed by a 20-minute drive to the resort. The eighty-six villas has been carefully design to instill a sense of wellbeing and to create an atmosphere of blissful relaxation. Each villas enjoy private plunge room and outdoor pavilion with dining table. The Raffles Seychelles offers a myriad of activities with the legendary Vallée de Mai as highlights. Nestled on the South Western Coast of Mahé Island in the beautiful Intendance Bay, the exclusive Banyan Tree hides away in a privilege location. Tucked around dense forest of palms, native takamaka and powder-like sand fading in the emerald waters of the Indian Ocean, the Banyan Tree resort provides a rare taste of paradise for your Seychelles holiday. Unique in its genre, the resort has some kind of spellbinding effects. It is perfect for honeymooners in search of privacy and tranquility, thanks to it secluded setting. The resort has been sensibly design to combine the traditional colonial style with a rustic background, allowing it to merge elegantly with its natural surroundings. The resort is a 30-minute drive from the international airport and a 45-minute drive from the Capital. Evoking a feeling of comfort and pleasure, the spacious villas of Banyan Tree is a mix between contemporary, colonial and ‘plantation décor’. The main theme here is romance, rejuvenation and exotic sensuality in a Seychellois style.